In November 2017, the North Korean medical team successfully completed training in treating Cleft lip and Palate (plastic surgery) and Club foot (orthopaedic surgery). During the two weeks, the medical team completed surgeries on 25 Cleft lip and Palate cases, and 38 orthopaedic patients. 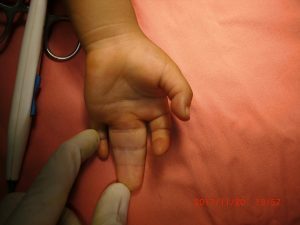 The surgeons were able to scrub in all these procedures, initially as observers to learn the techniques from CSC. The medical programme was deeply meaningful and provided the North Korean surgeons with extensive experience through participation in surgery for rare diseases. For our second medical training programme, this year (2018), we are planning to learn the necessary skills for various types of surgery. In particular, there is an urgent need of cataract surgery at the Disabled Children’s Surgical Centre in North Korea; therefore, we are inviting an Ophthalmologist for training along with a Paediatric Anaesthesiologist, as they have a vital role in paediatric surgery. Children suffering from untreated cleft lip and palate conditions experience discomfort carrying out even everyday routines which can lead to serious problems, with one of the biggest complication being the difficulty in or inability to eat. Children with serious forms of cleft lip and palate face difficulties consuming food, leading to their bodies suffering from malnutrition, stunted growth, mental and physical pain which has profound effects on their daily lives and education. However, early correction, treatment and simple surgery will help prevent and resolve these problems. There are children waiting for surgery right now and we can help them start a new life with a bright smile. In addition to treating children, there are also many elderly people suffering from cataracts. Cataracts can be treated with simple surgery procedures, but many patients are unable to receive treatments in North Korea. When patients with cataracts are left untreated, they are more likely to suffer from visual impairments, often affecting the individual and those around them. In hope of helping and treating more patients suffering from cataracts, an Ophthalmologist will also join the medical training initiative in March 2018. In succession to the second medical training in Cambodia in March this year, we are also planning to take an overseas medical team to North Korea to perform various surgeries and train other surgeons in June 2018. The medical team will consist of surgeons in various fields from overseas (e.g. Orthopaedic, Plastic surgeon, Ophthalmologist and Paediatric). This will be the first time that an overseas medical team would be invited to Disabled Children’s Surgical Centre. They will be working within the ‘Disabled Children’s Surgical Centre’, located at the Pyongyang Red Cross Hospital. The KFPD estimates that around 6% of the North Korean population have disabilities; of these 1.54 million people, many suffer simply due to lack of medical attention which can treat their conditions. Surgery and support not only relieves an individual’s condition, but also brings more joy and life to them and their loved ones. Though medicine may not cure all, we hope to instill a message of hope and courage to all who hear about our Surgical Centre. North Korean Surgeons training in Cambodia Thank you, St. Ann’s!